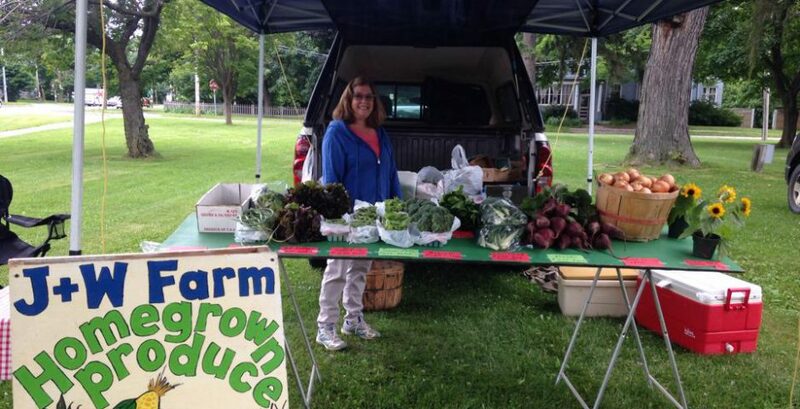 J&W Farm will be there with sweet corn, tomatoes, green beans, watermelons, onions, potatoes and more. Opies Gifts will be bringing reversible aprons, wreaths, scarves, paracord bracelets, dish cloths, and much more. Mellander’s Maple will be there featuring Nunda Mustards – Smokey Maple, Jalapeno, Horseradish, Honey Brew, and Tangy. Free samples! Phillips Organic will be there with organic garlic, chard, mixed salad greens & a few zucchini as well as Hill ‘n Hollow vinegars. Vicky will be handling Dave the Honey Guy’s stand this weekend and will be bringing new flavors this week: cinnamon flavored, butterscotch flavored, butter pecan flavored and vanilla butter nut flavored honeys. They’re hoping to have honey butter by next weekend also. Mackenzie Farm will of course have fresh corn but he is also going to be raffling off a bushel of corn! Woohoo! Plus all of our other vendors so stop and see us tomorrow morning starting at 9:00 am. Opie’s Gifts will be bringing wreaths, dish cloths, blankets, a few scarves, reversible aprons and paracord bracelets. Phillips Organic is bringing green and yellow beans, hard neck garlic, rainbow swiss chard and Hill ‘n Hallow vinegars. Nice Farms is bringing sweet and sour cherries, blueberries, raspberries and maple products. The Farmer’s Wife will be bringing baked goods and sandwiches. Dave the Honey Guy has additional flavors of honey including butterscotch, butter pecan and vanilla butter along with his wide inventory of honey products. Peg’s Produce will be bringing fresh bouquets of flowers including create-your-own, along with summer squash, cucumbers, soap and wreaths. J & W Farms will be bringing sweet corn, tomatoes, green beans, lettuce and peppers. Mackenzie Farms is bringing sweet corn and beets. Mellander Maple will be there with their maple products, Nunda Mustards and Once Again Nut Butters. It’s A Natural Farm will not be there this week with chicken and alpaca products but we will see them next week. Bev Hess is our entertainment and the Office of the Aging will be there along with Oatka Creek Watershed Committee rounding out or community booths. Thank you for supporting our local farmers and vendors! See you at the market tomorrow! Just a quick reminder that the Oatka Festival is this weekend therefore the Farmers Market has the week off. See you next week on the 23rd with more fantastic offerings! Of course Mackenzie Farms, J&W Farms and Dave the Honey Guy will be with us and if all goes well we hope to add two new vendors tomorrow! In the Manager’s Tent the artist featured will be yours truly, Mary Margaret Ripley with 3 of my pen and ink pieces. Just a reminder that next week July 16th there will be no market due to the annual Oatka Festival which takes place all weekend. Come and enjoy our local festival with great food, entertainment, raffles and of course the duck derby down the mighty Oatka. Hope to see you tomorrow morning! Thank you for shopping local!